Looking for a Professional Home Appraisal in the Houston Spring Shadows Area? As one of the leading providers of residential and commercial valuation services in the Spring Shadows area, our Texas certified appraisers can help you with values for both private and lending use. Our goal is to provide our customers with a quick, reliable and comprehensive appraisal service that meets or exceeds their expectations and requirements for use. We have some of the lowest appraisal costs in the area and take pride in delivering completed assignments faster than the average appraisers. All of our appraisers are Houston area locals and have over a decade of experience in the market area. We employ appraisers capable of taking on all assignment including residential, commercial or mixed-use. For commercial projects we only assign Texas Certified General appraisers with at least 10 years of experience in the Houston market. Whether you need a real estate appraisal report for financial, private use or a legal issues, our appraisal services can accommodate almost any real estate valuation needs. Whether you’re a homeowner or an industry pros, we take pride in providing a friendly and reliable service. If you have any questions or you’re ready to order an appraisal, please call the phone number on this site or fill out the appraisal request form found above. Getting in touch takes minutes! 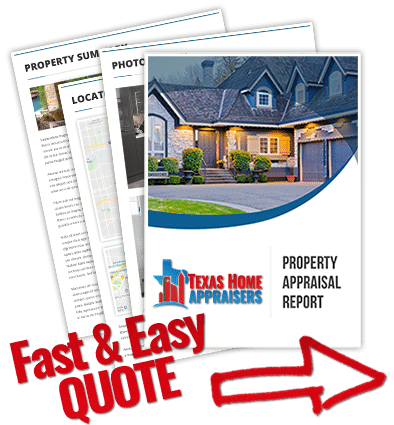 Simply complete the web quote request form or dial our office and one of our public houston property appraisers will be happy to talk about your project. Is the appraiser going to measure my house for his report? Yes, most of the time. The Appraiser will measure the home’s square footage and will most likely follow ANSI Standards. A “lazy” Appraiser (yeah, we said it) will use rounded estimates to determine the home’s square footage. If you have any documentation that accurately delineates the square footage (like the blueprints) then we suggest leaving that for the appraiser’s review. State regulations, as well as strict industry standards promise to insure appraisers have met substantial experience and educational demands set by the TALCB (Texas Appraiser Licensing and Certification Board). Additionally, appraisers must perform several thousand hours of appraisal work as an apprentice before gaining their license. As an ethics requirement, appraisers must demonstrate competency in their chose geographic area before accepting assignments. Why should I get a real estate appraisal? Because much private, corporate, and public wealth lies in real estate, the determination of its value is essential to the economic well-being of society. For an appraiser to develop an opinion of value, the property will be compared and contrasted to other similar properties recently sold on the market. The appraiser’s role is that of the unbiased observer who provides a professional opinion of value based on years of experience and specific research. And because the appraiser is trained to be an impartial third party in the lending process, this profession serves as a vital “check in the system,” protecting real estate buyers from overpaying for property as well as lenders from over lending to buyers. An appraiser identifies and provides a value for various types of property. Appraisers often work as consultants in residential and commercial markets where expert knowledge of the valuation process is required.